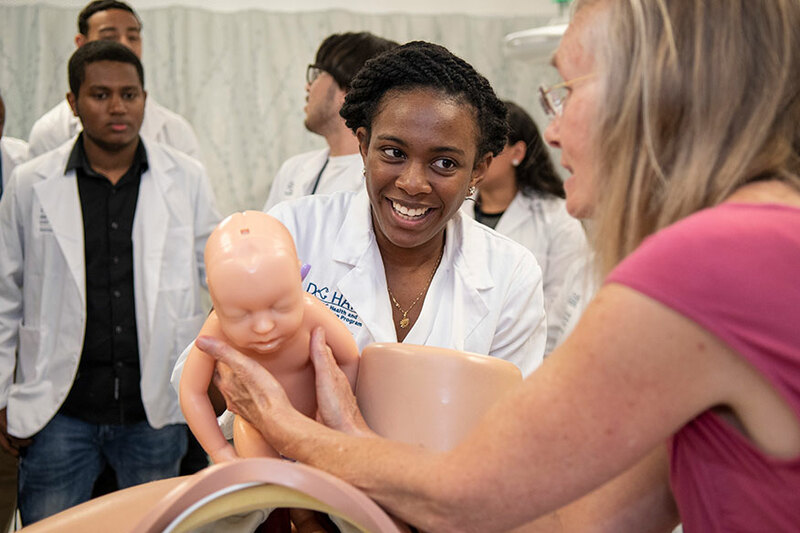 Natalie Custodio, a rising senior at E.L. Haynes Public Charter School, stood wide-eyed in George Washington University’s (GW) Clinical Learning and Simulation Skills (CLASS) Center watching a simulated birth. Moments later, she stepped into the role of a doctor and helped welcome an infant into the world. The experience offered a glimpse at what her future career could look like. “I am very passionate about practicing pediatrics,” Custudio said, adding that the simulation was her favorite part so far of the DC Health and Academic Preparation Program (DC HAPP). The pipeline program, coordinated by the GW School of Medicine and Health Sciences (SMHS) Office of Diversity and Inclusion, works to increase access to health careers and expand diversity in the medical field, according to Jinny Jang, MA ’17, assistant director of the Office of Diversity and Inclusion at SMHS. The program includes a day in the CLASS Center, where students learned to intubate, draw blood, and assist in the birthing process. They also earn CPR certification, and this year the cohort visited the Booz Allen Innovation Lab to learn about health care consulting and took a trip to the Washington DC VA Medical Center. After the summer program in July, students also have the chance to shadow health care professionals at GW Hospital, added Jang. That aspect began last year through a collaboration with the GW Health Workforce Institute, which funds the program, and Milken Institute School for Public Health at GW (Milken Institute SPH). In her remarks at the white coat ceremony that kicks off the program, Yolanda Haywood, MD, RESD ’87, BA ’81, senior associate dean for diversity and inclusion, associate dean for student affairs, and associate professor of emergency medicine at SMHS, asked the students about the significance of the iconic garment. Haywood applauded all of the answers, but refined them to seven elements the white coat signifies: compassion, strong work ethic, knowledge, confidence, humility, passion, and professionalism. During the ceremony, McKinley Technology High School senior Jalen Templeman said he was excited for the chance to better understand the medical field and public health through DC HAPP. Science and health care “is fascinating,” he said, adding that he comes from a family of pharmacists and physicians. “I’m interested in pharmacy, but maybe even [becoming] a biochemist making new medicines for people,” he said. The program, Jang noted, is supported by volunteers from throughout SMHS, with MD students and a Milken Institute SPH student serving as mentors, physician assistant alumni visiting for a panel on the PA profession, and faculty and staff all working together to make it a success.